With the screenings in Berlin and Prato we had the opportunity to see for the first time in sequence the two films we realised under the Re:centering Periphery label. We found ourselves together with a great number of friends, whose feedback has been very helpful to reflect on the outcomes and gave us the opportunity to formulate some considerations about the advancement of the project and its coherence. We want to share these through this post. However, the two films are quite different. First, because there is a clear technical improvement both in the format and in the language. Second, because the social, environmental and political context where they have been shot is quite different, and they clearly show the necessity of adopting different solutions and languages. Third, because they have been realised with different timing and depth of engagement: the first, in Cuba, was completely shot within one trip, five weeks of full immersion in a totally unknown place; while the second, in Moscow, has been the collateral product of a series of trips connected to different works on commission, from which we have been able to spare some time to develop our voluntary project; but on the other hand, this limited and influenced the topics and places explored in Moscow to what was consistent with the task we were committed within the RKM campaign. Ultimately, Dom Novogo Byta introduced some stylistic innovation respect to Doble Forza. If the latter is basically the diary of an urban exploration which deploys almost unprocessed fragments of video, including shots of archive footage shot directly at the moviola, and mapping workshops made with local inhabitants, the more difficult and opaque setting of Moscow forced us to adopt more elaborated solutions and to introduce new elements that we were not used to: a voice over providing a narrative thread, the massive use of archival material, the introduction of a fictional character reading excerpts form literary works, that is a novel by Bulgakov read by an actor. Nevertheless, we do not feel the introduction of these new elements as a deviation from our approach and language, rather as an expansion of the usual expressive palette consistent with our language. Again, the story is narrated as the diary of a personal exploration, including our usual obsessions and idyosincracies. The novel by Bulgakov is one of the preparatory readings that anticipated and accompanied our trip to Moscow. The young actor reading it in the film is like almost everything else the result of an accident: a nice young guy stopping in the metro to ask if we needed help finding our way, quickly enlisted in the project. The archive material has been the everyday matter of our parallel work for the RKM campaign. Finally, the voice over is the direct consequence of the opacity and elusiveness of Russian society, which revealed very difficult to be narrated simply through images captured in situ. And all over, the difficulty with Russian language , which forced us to tell with our words many things that we thought should be said but were not evident from our images and interviews. Rather, aside from the many new elements introduced in DNB, we find that the two film have a logical consequentiality and a coherence as common parts of an overall project. First of all, the process through which they have been created is similar. Both films have their origin in the invitation to realise a site specific artwork for an exhibition. In both cases, the artwork has been the occasion to drift with flaneuse attitude into unknown places and to develop a first instinctive relationship with the matter, that has been subsequently investigated with more systematic approach. In both cases the first artwork has been also the stage in which soundscapes and sound materials have been processed and elaborated in the form of a musical composition, which constituted an important basis for drafting the successive montage of images and topics. Furthermore, the serendipity in the process of selection of the subjects of the films let nevertheless emerge connections and parallels between the two locations and histories. 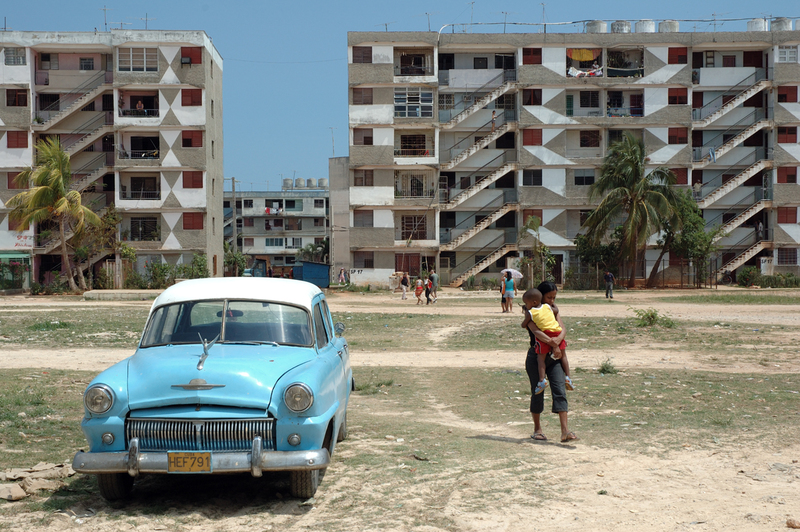 In Cuba the random starting point of our navigation into the history of modernist urbanization has been the dream of a self built city, launched in the 1970’s by Fidel Castro involving collectives of workers realising their own homes (microbrigadas). 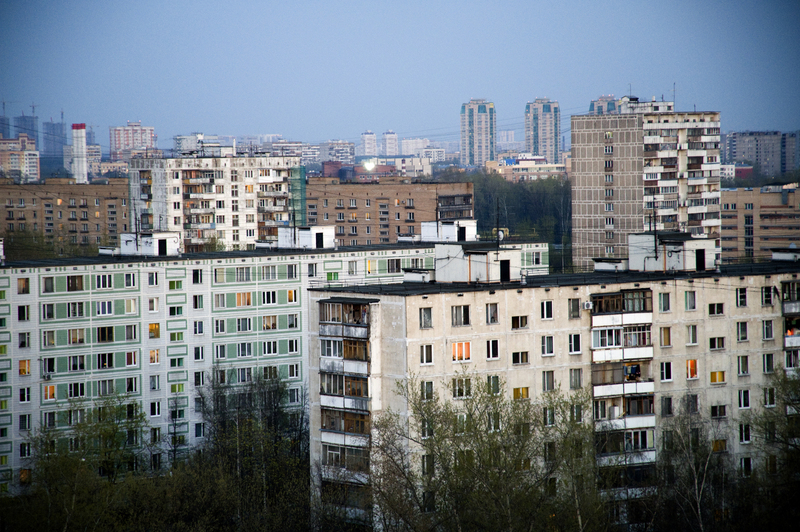 They had inherited a rudimentary prefabricated concrete panel technology from USSR. 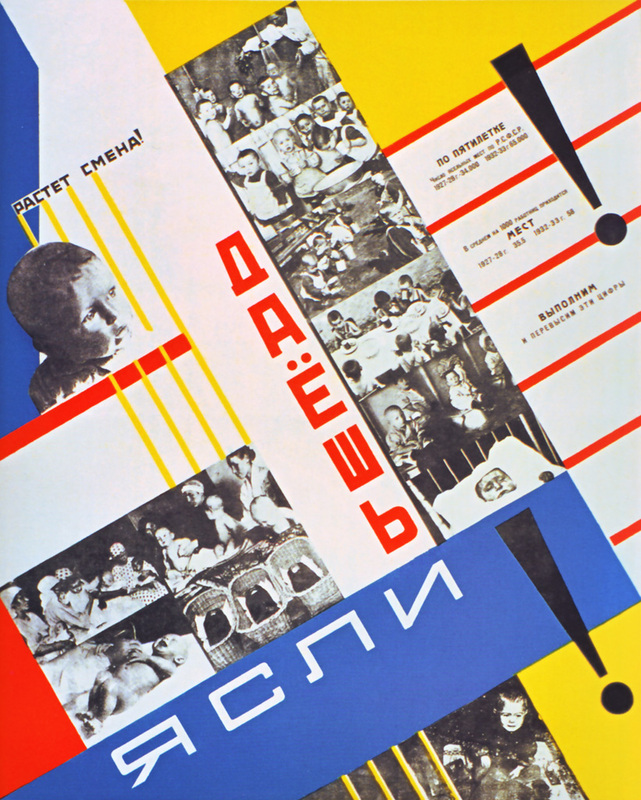 In the second film we had the opportunity to jump back at the dawn of soviet revolution and of the search for technological solutions to the dwelling problem of an increasingly urbanized society, to discover the incredible blossoming of ideas and new visions produced by the avant-gards: among which, the important contribution of constructivist architects to the international debate about modern city and architecture, and the rupture brought by Stalin with the perversion and marginalization of their ideas. In both cases, artist and intellectuals still inhabit and reclaim those spaces, as the Omni Zona Franca collective in Alamar, which constitutes one of the most lively voices in the cultural landscape of Cuba today, or the marginalized artists which try to recuperate the cultural significance of the Narkomfin in today’s Russia, neglected between the interests of politicians, developers, cultural institutions and even residents of the building struggling for their material survival. Finally, in both locations, the built environment produced by progressive ideologies appears as defeated by the course of history and abandoned to degradation and contempt; if in Moscow there is some minimal attempt at protecting the architectural heritage and valorising it in the context of new economic approaches – renewal for cultural and touristic business – no attention at all is showed for the value of the social utopia they originally wanted to represent: collectivisation, self management, reform of the bourgeoise family organisation… a defined research question emerge fro the prosecution of the project: is there still place for social imagination in the triumphant and imploding capitalist world? Finally, we are moving on toward next steps in the exploration. It is again the contingency of opportunities more than a definite plan guiding us to work on Belgrade and Berlin, again two (partially) ex socialist cities, which is keeping Re:centering Periphery extensively focused on the exploration of the state directed modernist city, before moving into market-driven embodiments of the modernist city. 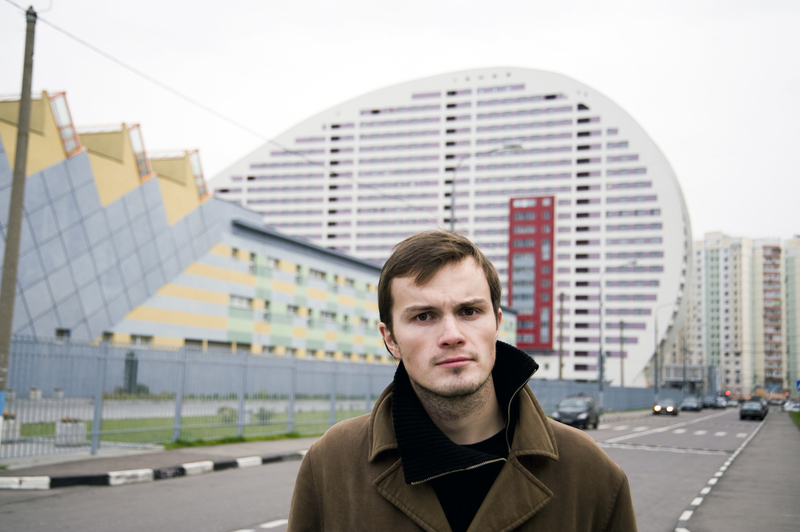  Archived in journal, reflections and tagged Bulgakov, Doble Forza, Dom Novogo Byta, microbrigadas, Narkomfin, Omni Zona Franca, Re:centering Periphery. Bookmark the permalink.